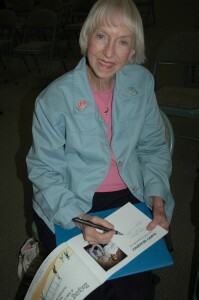 Outer Banks children’s book author and recipient of the 2011 Land of Beginnings Living Legend Award, Suzanne Tate, will be reading her two Wright inspired books as part of Soaring 100, October 21 – 24, 2011. Soaring 100 is the centennial celebration of Orville Wright’s 1911 world record 9 minute, 45 second gliding (non-powered) flight and the birth of modern soaring. Tate will read Flyer, A Tale of the Wright Dog, and Helping the Wright Brothers, A Tale of First Flight Helpers, Saturday, October 22nd and Sunday, October 23rd in the pavilion at the Wright Brothers National Memorial. Flyer was Wilbur Wright’s companion while he was in France for flight expositions, 1908-1909. The book includes the French fascination with the airplane, the Wrights’ trip to Italy and introduces Edith Berg, the first woman to fly in an airplane. It was Bill Tate, the Kitty Hawk postmaster, who replied to the Wright brothers’ letter inquiring about weather, specifically winds, on the Outer Banks and convinced them to come to come to the Outer Banks. And it was his wife who loaned the Wrights the sewing machine to sew the cloth for the flyer. None of the Tates were present for the first powered flight in 1903. Amongst family members it was understand that Bill Tate regretted this all of his life, added the author.